I have a confession to make. I’m 34 years old and I had never tried Brussels sprout until a few months ago. I was an extremely picky eater as a child. I never ate vegetables because I thought they smelled and tasted funny. I absolutely refused to try Brussels sprout. I thought the smell was so gross. John loves Brussels sprout and asked me if we could have some for supper sometime. I eat my veggies now and thankfully grew out of my picky behaviour so I said sure. I’ve roasted them in the oven, but my favourite way to eat them is with a little bit of lemon, onion, mushrooms and pancetta. It’s delicious! I first discovered this recipe on my Better Homes & Gardens recipes app on my iPhone. I modified it a little bit to cut down on preparation time. It takes about a half hour to prepare from start to finish. 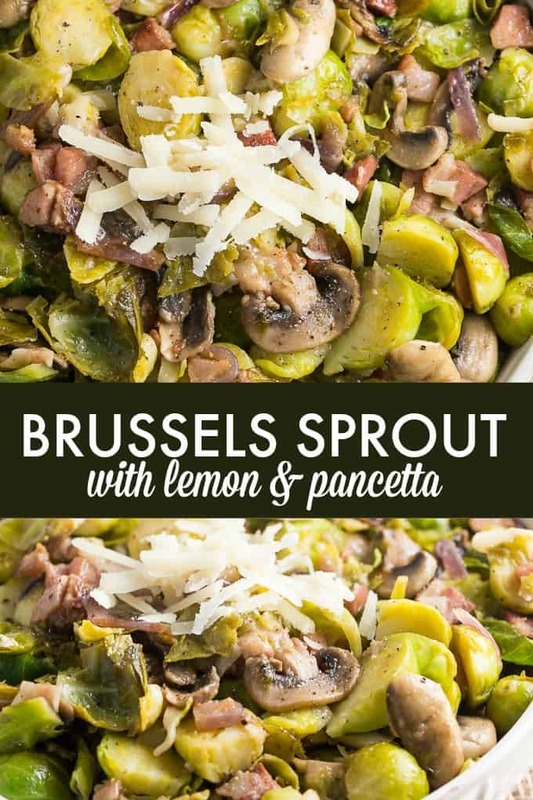 This recipe made me love brussels sprout again! Trim stems and remove any wilted leaves on Brussels sprout. Cut in half lengthwise. In a large pot, bring salted water to a boil. Add in Brussels sprout and cook for 8 minutes. Drain and set aside. In a skillet, heat oil over medium high heat. Add in pancetta and cook until crisp. Add mushrooms, onions and garlic to skillet and cook for 5 minutes. Add Brussels sprout, salt & pepper to skillet. Cook and stir for 6 minutes. Remove from heat and add lemon juice. Stir to coat. Sprinkle with cheese and serve. Never had brussel sprouts till then. You dont know what you been missing. We like them and when my kids were little they called them martian heads LOL. They are great with cheese on to. Thanks for the recipe it will be a different way we can make them. I didn’t grow up eating brussel sprouts and never got a chance until just recently myself as well. Weird as I’ve had pretty much every other vegetable imaginable. I do like them, I’ve found, so this recipe will be perfect for me to try out. Plus the lemon, garlic and parmesan had me hooked in as soon as I read the ingredient list, so for sure I’ll be making this. Mmmm!! I just eat them w/garlic but this sounds so good! There are very few veggies I don’t like, but brussel sprouts are of the devil. Bleech. Now, having said that my husband thinks that brussel sprouts are from heaven! He love lemon and panchetta. Guess what I will be making for him? Thanks for the recipe! Ok, you actually have me thinking about trying Brussels sprouts. My daughter has talked about roasting them with oil before, but I just was interested. Lemon and onion is right up my alley. I think this would be a great side to have with fish or even steak. Oh, I love brussels sprouts. This sounds absolutely divine, and I’ll have to make it! I like brussels sprout with butter , may try the garlic. Thanks. I had a really similar experience! I hated brussel sprouts as a kid so I avoided them for years. I just tried them again recently and was surprised to find they’re actually pretty good! I love brussels sprouts! They’re like miniature cabbages. Fun to peel, fun to play with, and YUMMY. Love brussels sprouts. They might be one of the few veg I can call adorable. I’ve never tried them either! But I might have to give them a shot and try this recipe! i have always liked brussel sprouts. no one else does in my house but I fix them for me. I like this recipe and will be using it. Thanks for post. New to brussels sprouts. This recipe looks amazing! always looking for new ways to make brussel sprouts. this sounds great. I too never liked brussel sprouts because of the smell!!! ugh….. 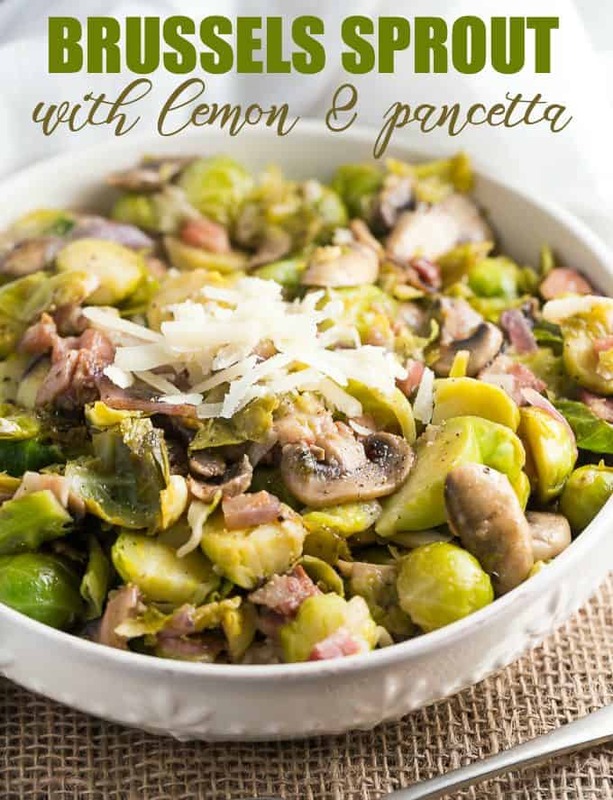 I love Brussels Sprouts, this recipe sounds very good, thanks for sharing. I am not a huge brussel sprout fan. This recipe looks good. my husband loves them, so I could at least give it a shot. Thanks for sharing. I love brussel sprouts, my husband just starting eating them after he tasted them roasted!! This sounds so good! I really like brussel sprouts! I will be making this. Thanks for sharing! This sounds so good!! I really like brussel sprouts! I will be making this. Thanks for sharing! i love brussel sprouts…..or ‘alien heads’ as we call them. this recipe looks really good. i am a vegetarian so i would leave out the meat part. my favorite way to cook them is spray a little olive oil and garlic salt and pepper and roast them in the oven. nom, nom, nom…. This sounds delicious, I’m always looking for ways to dress up vegetables for a little variety. Thanks for the recipe, I can’t wait to try it! This looks AMAZING! I’ve got to make this! Thanks for sharing the recipe. I could eat a large bowl of this! YUM! Always great to find a new vegetable recipe! My mom’s coming to visit next week and I’m sure she’d love this! She enjoys Brussels sprouts and mushrooms so I think this would be a hit. Thanks! OMG I love brussels sprouts. Thanks for this recipe. Obsessed! Looove brussel sprouts now that I’m older. I’m used to roasting them and I’ll definitely try this. Best thing is we grew them for the first time last year and still have some frozen! Thank you for sharing with us at Funtastic Friday! I LOVE brussels sprouts! This dish looks delish! I’m not a fan of mushrooms – but could certainly swap those out for something else! Pinning this! haha I discovered brussel sprouts late in life, too! A friend made them this past Thanksgiving, and I loved them. Now I make them about once a week. I’ll be sure to try your recipe…looks delish! Thanks. This will be a delicious Brussels Sprout recipe! Hope you are enjoying your day and thanks so much for sharing your awesome post with us at Full Plate Thursday! 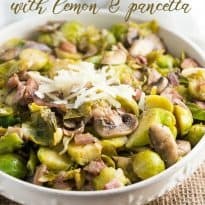 My hubby loves brussels sprouts,i’m going to surprise some evening with this dish !